The legions of construction workers building Rockefeller Center were an exception. As the twelve buildings that would comprise the Center slowly took shape, a scraggily balsam fir still managed to hold out, rooted in the rock at the eastern portion of the central lot near the booth where the men collected their paychecks. On December 24, workmen light-heartedly strung cranberries and paper garlands on the tree and hung a few tin cans from its branches. 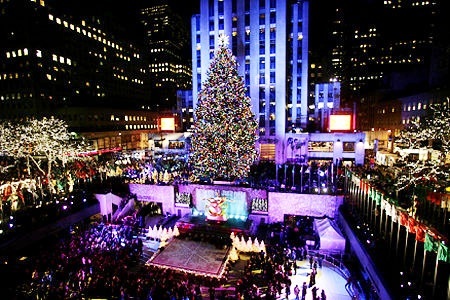 Rockefeller Center had its first Christmas tree. The Center was not without a tree after that. Merle Crowell, Rockefeller Center’s marketing manager, recognized the potential and, as the first years passed, created an icon. Organ music was piped into the plaza from Radio City Music Hall, and glee clubs and girl scouts, local choirs and female trumpeters were variously used to draw crowds. Crowell saw to it that the first formal lighting in 1933 was televised; a full two decades before televisions would become common in American households. The tree quickly became an annual event, anticipated by everyone and heavily covered in the media. When the tree was chosen, the location, size and owners were immediately publicized. And the arrival of the tree, to this day, draws emotional attention. Tree have arrived by truck, have been floated down the Hudson River, and have inched their way through Manhattan streets and avenues before dawn. For a period live reindeer in pens accompanied the tree. To meet the Center’s specifications, the tree must be at least 675 feet tall and 35 feet wide. But in 1948 the Norway spruce soared to a whopping 90 feet. In 1954 artist Valerie Clarebout created the white wire sculptures of the trumpeting herald angels that flank the Channel Gardens leading from Fifth Avenue to the plaza. Although they were intended to be temporary, the public insisted they become a permanent part of the Christmas tree setting. As the debilitating financial recession disheartened the country in 1973, the Center announced that the 65-foot tree would be “a little less bright this year.” The tree that year was turned off several hours earlier and 25 percent fewer lights were used. A few years later, on December 9, 1980 only a few hours after the lighting of the tree, a 19-year old Bronx man climbed to the top. “But he soon came down into the arms of waiting police officers,” said The Times. Today the tree is topped with a Swarovski star, 10 feet in diameter and consisting of 25,000 crystals. Over five miles of 30,000 lights are used and, starting in 2010, those bulbs are energy efficient LEDs. The daily energy savings they create is equal to that used to power a 2,000 square foot home for a month. 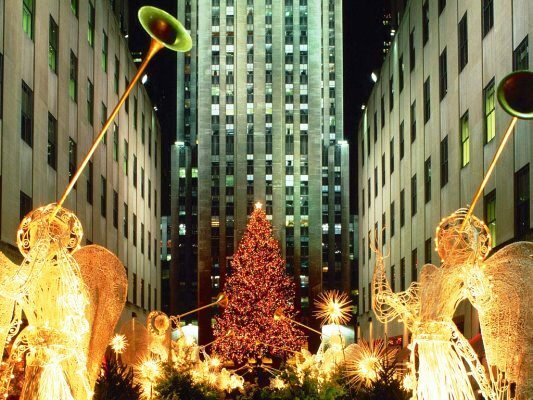 After New Years, until 1972, the gigantic trees were “lopped into pieces at Rockefeller Center and carted away to the city dump,” as The Times reported. Environmentally-conscious citizens questioned the waste. Creative recycling took over with the tree being reduced to, in one case, 3 tons of mulch donated to the Boy Scouts or donated to the U.S. Equestrian team in New Jersey, used as a cushioned obstacle jump. The 2010 tree will be used a lumber for Habitat for Humanity projects in New York, Indian, the Gulf Coast and Brazil. 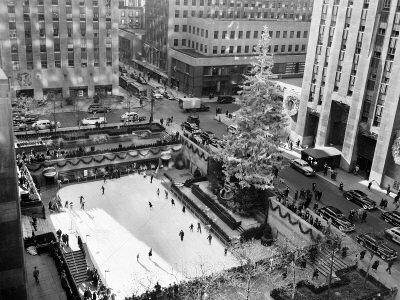 From its modest Depression Era beginnings the Rockefeller Center Christmas tree has risen to celebrity status. The lighting ceremony is now a 2-hour nationally televised event. Tens of thousands of tourists flock to the tree every day throughout the month of December and the majestic tree manages to relight the holiday spirit in nearly all of them.